Have you thought about buying your Valentine a gift yet? The 14th February is only a couple of weeks away so time to start having a think. Trust me you don’t want to be the last one buying some half dead roses from a garage! Take your time and think about what your loved one would like. I’ve got some incredible gift ideas for you right here, and the chance to win some of them! Read on for more.. 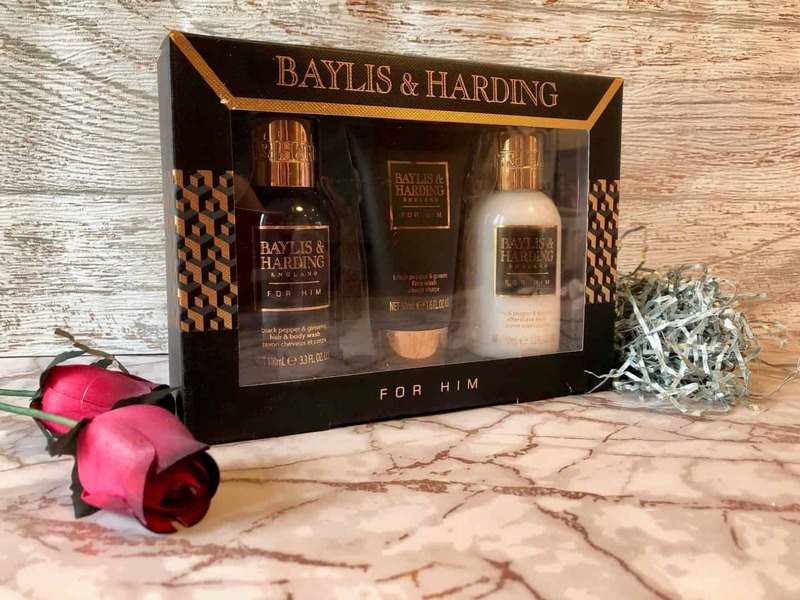 The perfect gift for that special man in your life, this wonderfully-presented set from Baylis & Harding. 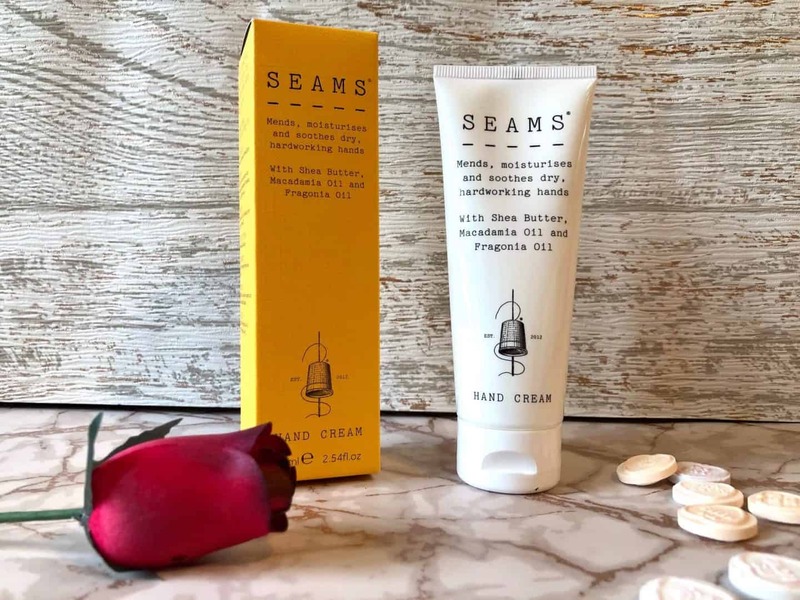 Treat your loved one to some beautiful hand cream like this one from SEAMS. It’s perfect for very dry and distressed hands. Absorbs with no greasiness. 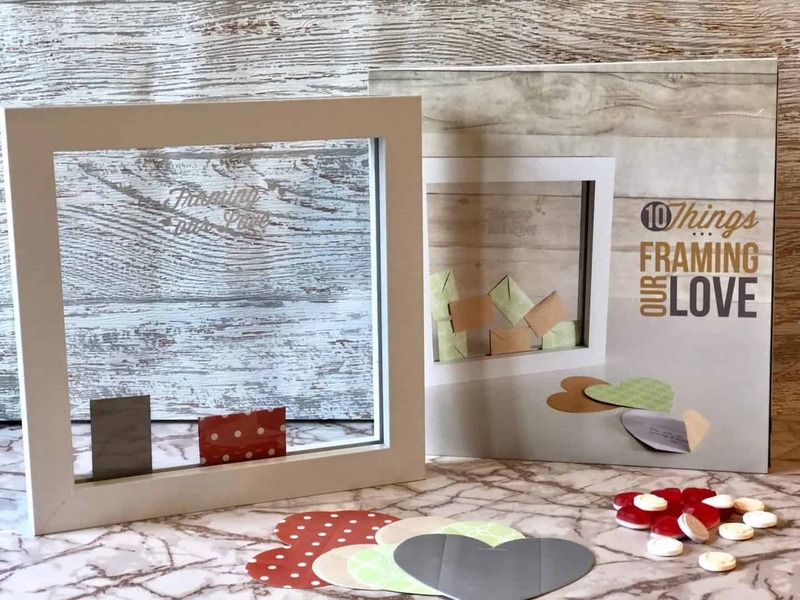 To win Framing Our Love, head over to this page. 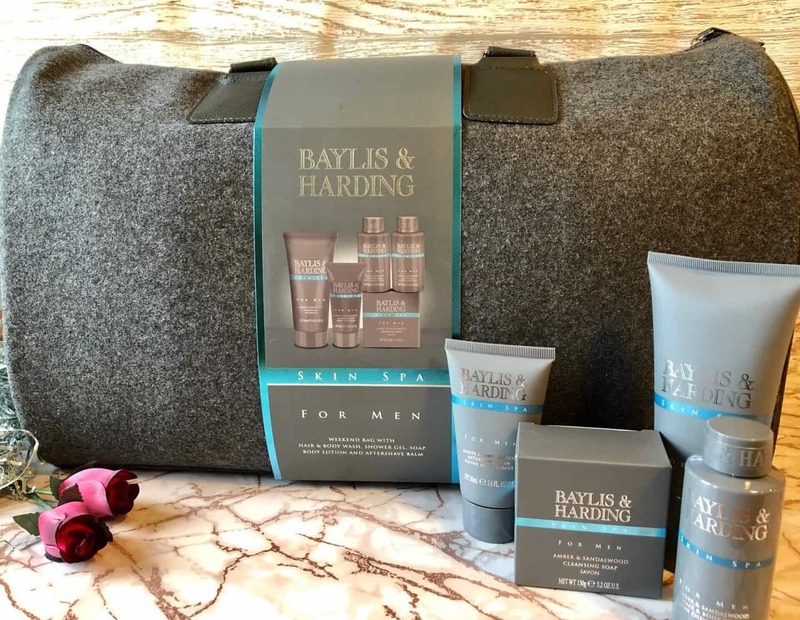 This weekend bag from Baylis & Harding is the height of luxury grooming, containing everything the discerning gentleman could ever require. It would make the perfect gift for your man, to maybe use when he takes you away for a weekend. The bag contains shower gel, soap, hair and body wash, aftershave balm and body lotion. 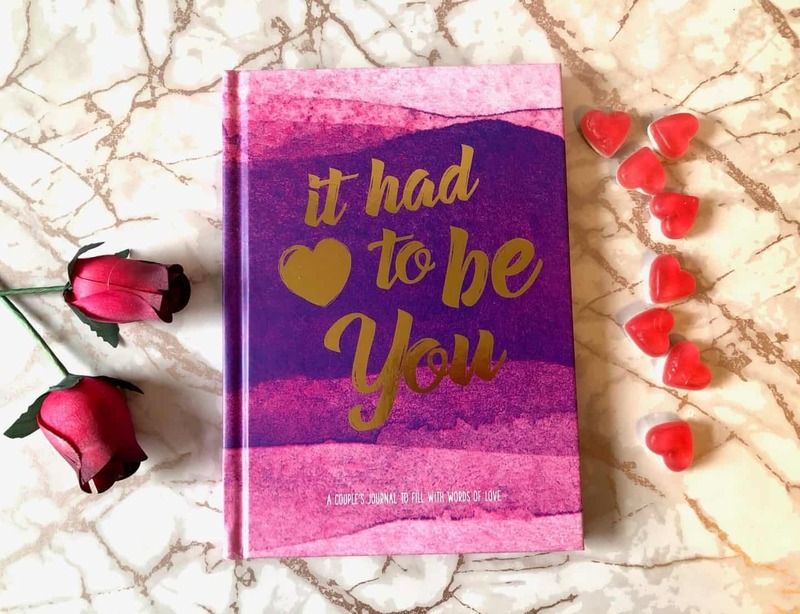 This beautiful couples journal features prompted sections where you can write down the story of your romance. Along with love letters and poems of famous lovers. To win this journal head over to this page. 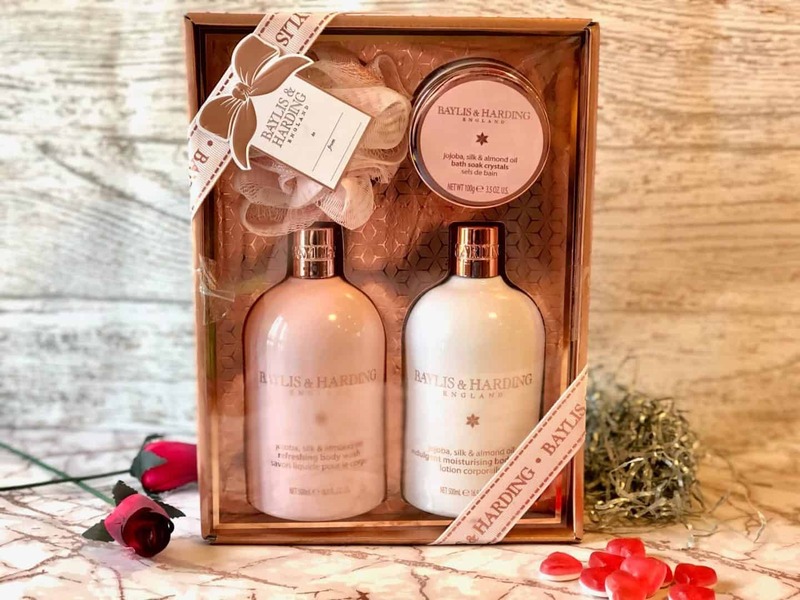 Presented in a beautiful pink box, this gorgeous benefit set from Baylis & Harding will make an ideal present for a loved one. The gift set contains 500 ml bottles of body wash and body lotion, plus 100 g of bath soak crystals and a luxury nylon body polisher. 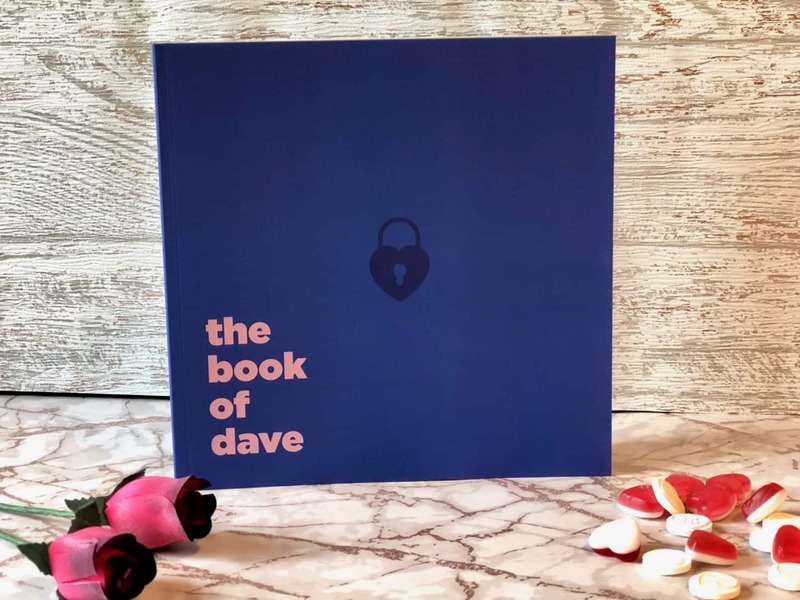 A one-of-a-kind personalised book for the one you love, the book of romance includes exquisitely designed personalised moments and messages of romance to celebrate why they are the one for you. Shhhh I made one for Mr B! The are fully customisable from the front cover colour, to names, dates and personal messages. The World’s First SPF50 Self Tan Luxury Lotion cream, could be a loving gift for a girlfriend. A tan can make you feel good about yourself and by using Tancream you are also protecting your skin. 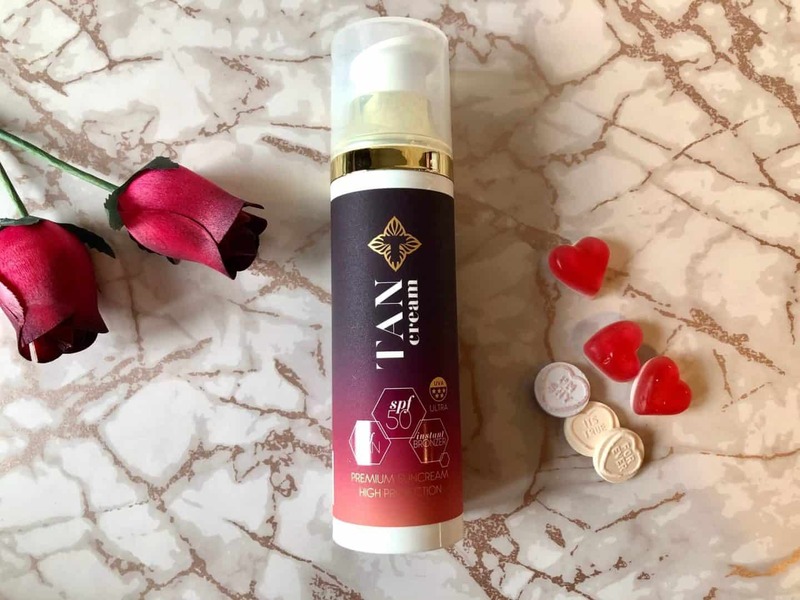 Tancream carefully blends sunscreen and sunless tanning agents to create an innovative luxury face and body lotion offering SPF 50, a superior self tan, a tint of natural bronzer and moisturising properties all in one bottle. To win this Tancream, head over to this page. 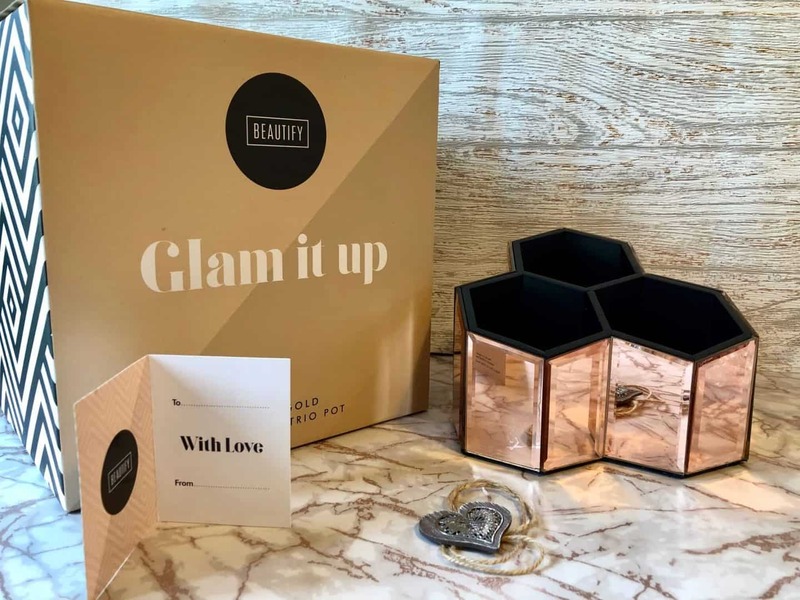 A great gift idea for females of all ages, this elegant hexagonal glass design an eye-catching mirrored exterior is sure to put a smile on anyone’s face. You can keep makeup brushes, hairbrushes, and beauty products neat, tidy and easily accessible. 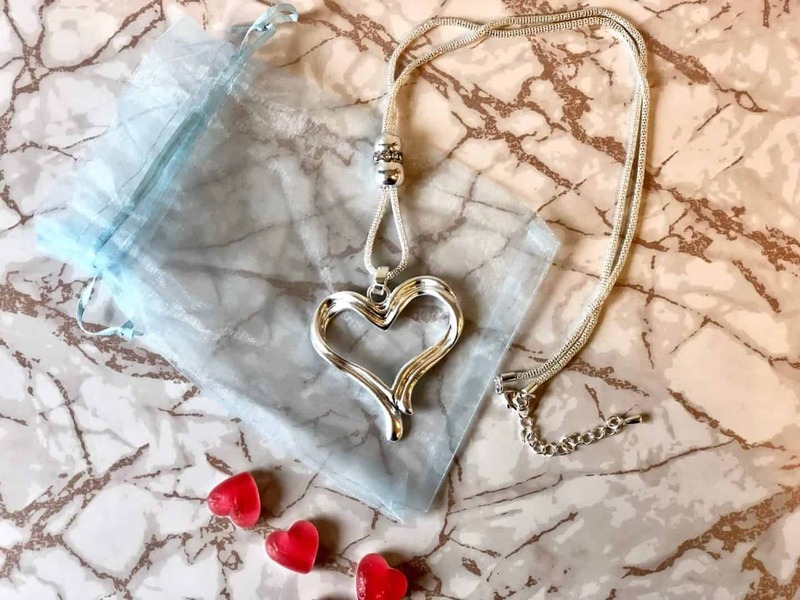 This stunning heart shaped necklace would make a lovely gift. Perfect for wearing with any style. 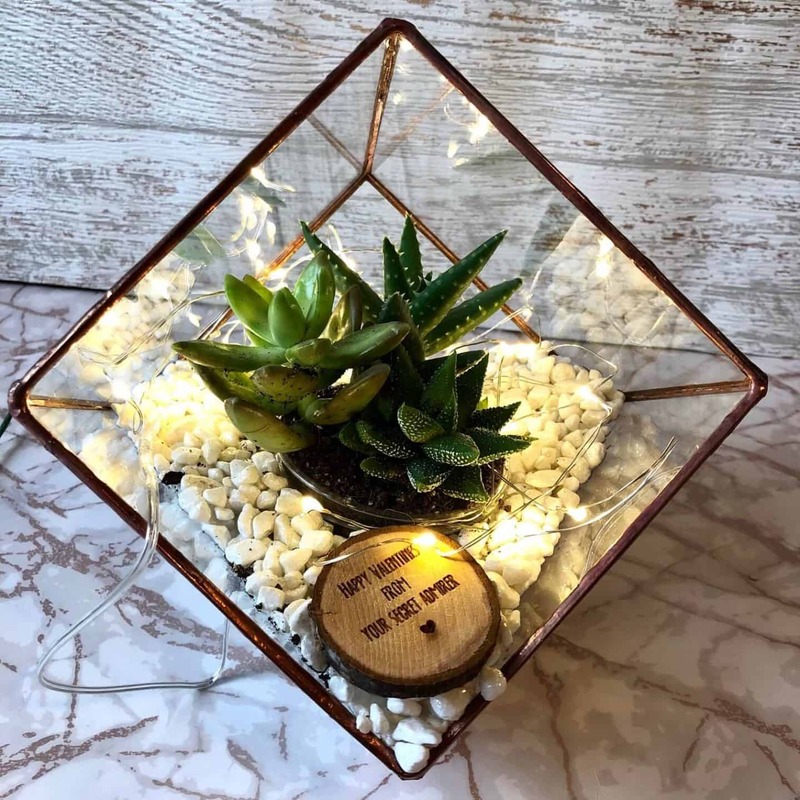 This Limited Edition Valentine’s Mini Copper Cube Terrarium is the perfect gift to show your love this Valentine’s Day. The copper terrarium features white gravel that beautifully compliments the trio set of succulent plants. As a huge lover of cacti and succulents this would be my ideal Valentine’s gift. It’s simply stunning. It can arrive fully made or you can DIY and put all the components together. Including adding fairy lights! A cute little addition is the personalised wooden round which can host your message to your loved one. If your loved one has everything this is the gift for them! 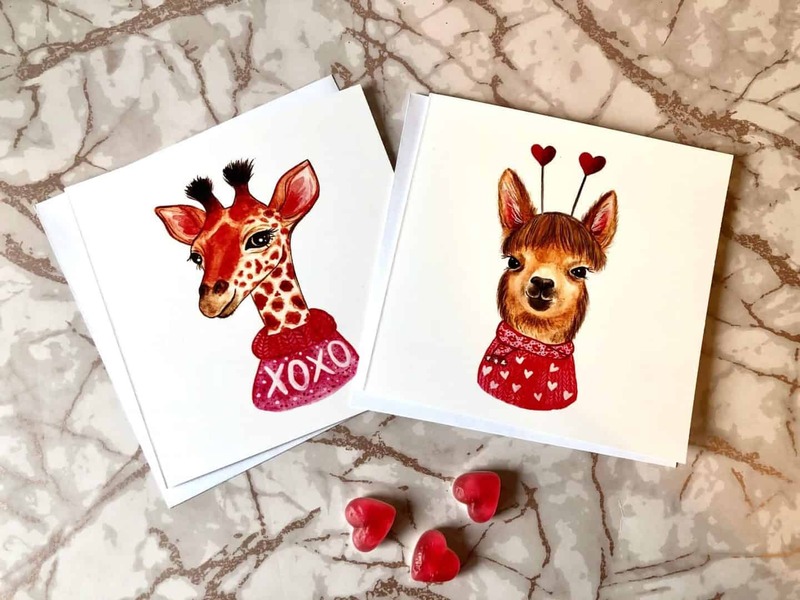 I adore these printed watercolour Valentine’s Day cards. They are so cute! Perfect for llama and giraffe lovers! Supporting small businesses is a fantastic thing to do. These cards are priced at £2.50 each and made with lots of love. They are blank inside for your own personal message. 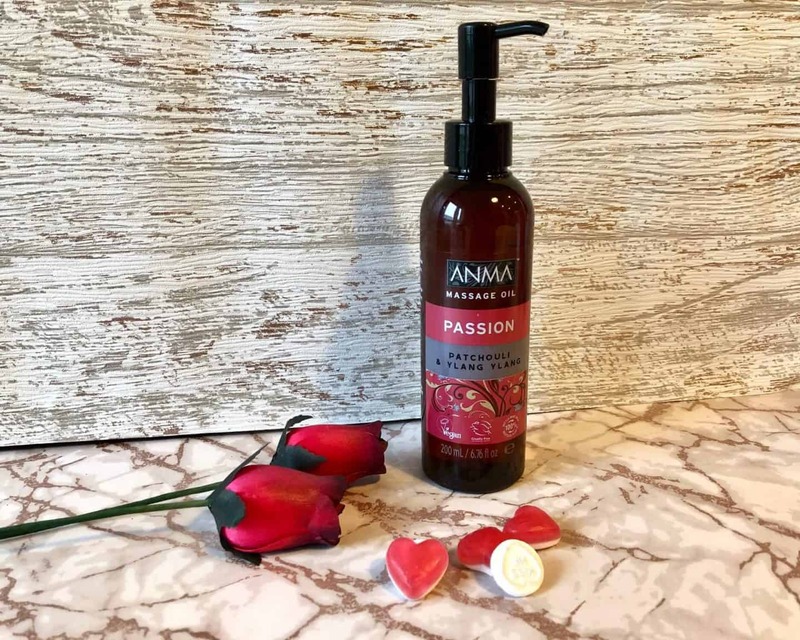 Created with the finest and essential ingredients, Anma massage oils are the go-to spa at home. 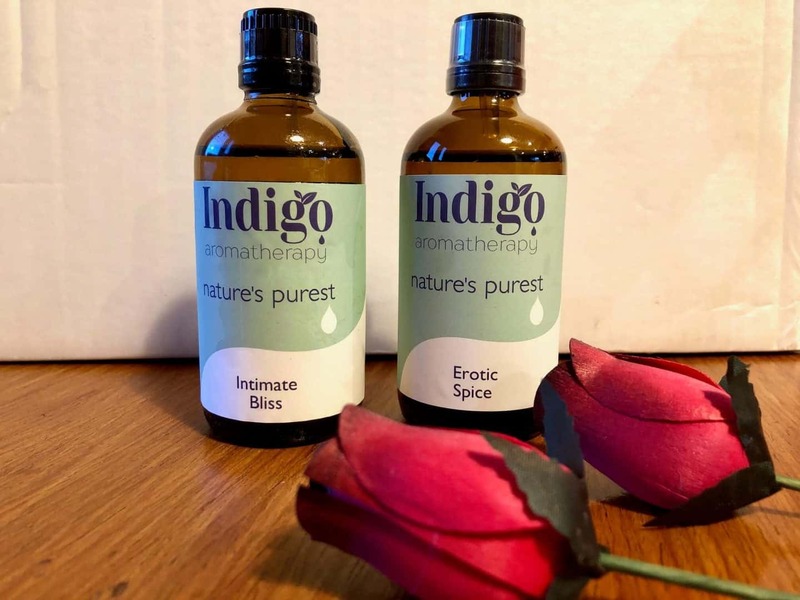 With blends of unique ingredients, these oils are designed to revitalise your senses and well-being. The perfect gift for a romantic Valentine’s evening. 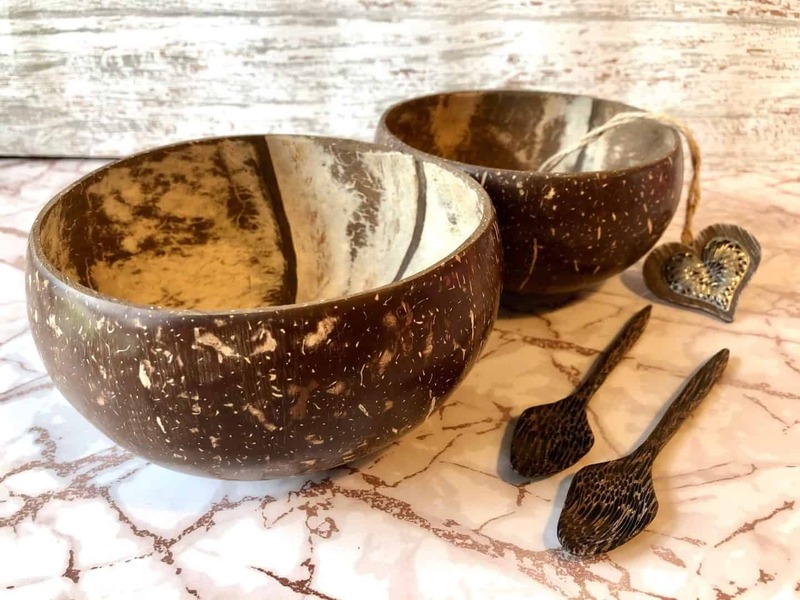 So if you are looking for something a little unusual for a gift for a loved one, especially if they are into reuseabe and Eco-Friendly products, why not give them the gift of these special bowls. Made from reclaimed Thai coconut shells. Each bowl is 100% unique with its own colour, shape, design, pattern. they can with stand hot and cold foods, or they can be used as decorative pieces. Long lasting and durable. 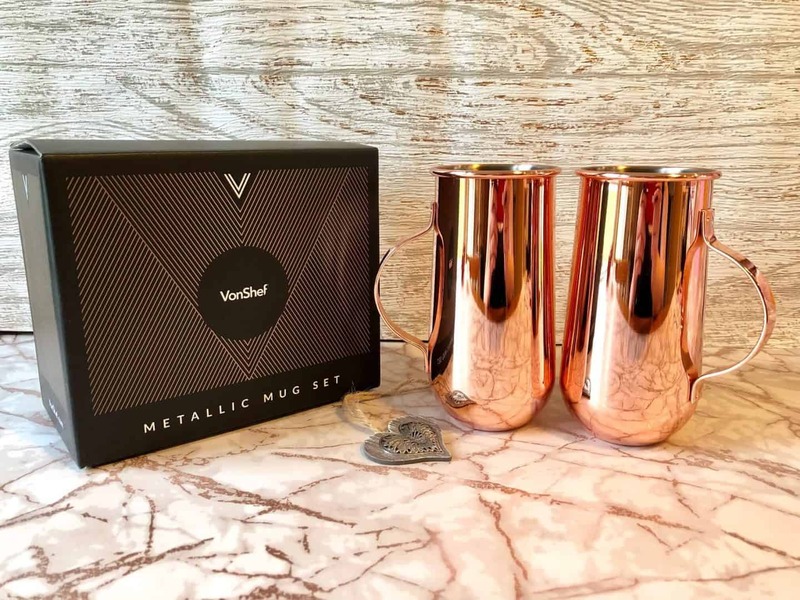 A sparkling snazzy gift to a loved one of these copper mugs would be fantastic! A great addition to the kitchen. 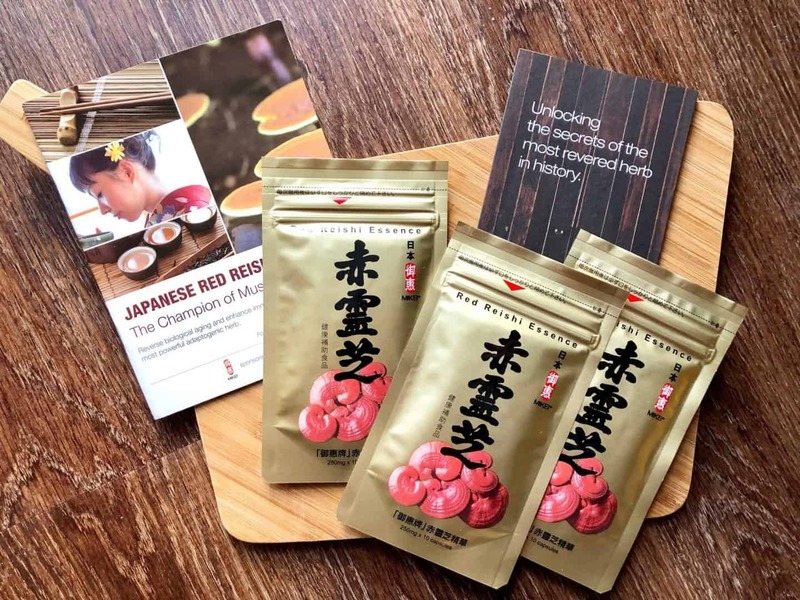 They are shatterproof, perfect for any hot or cold drink and wonderfully packaged. Most men love the gift of socks! It’s the fail safe gift isn’t it? 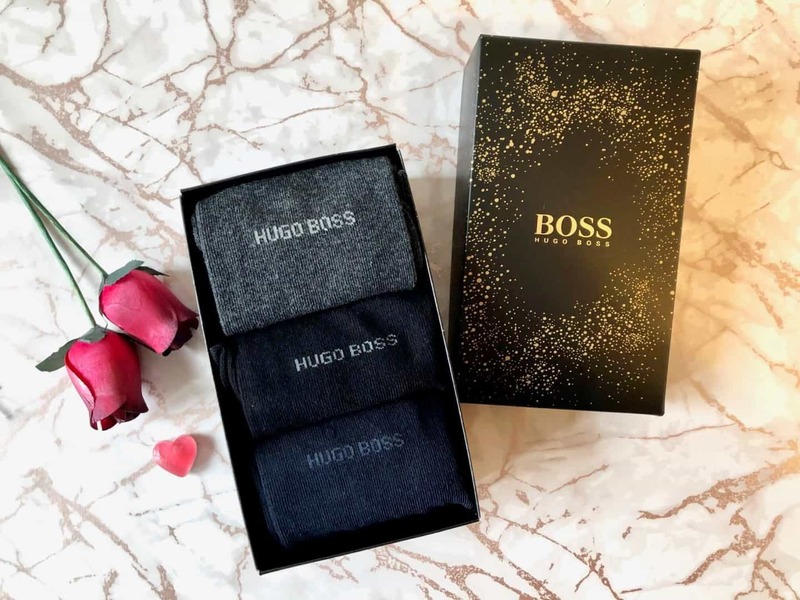 This lovely Hugo Boss 3 pack sock gift set is perfect for the man in your life. They come wonderfully packed in a gift box. There is always time for some naughty but nice fun on Valentine’s, it’s what Valentine’s is all about isn’t it? Well this may be the perfect accompliment to your evening. The Satisfyer Partner Multifun is designed for women, men and couples. This fun toy is a great edition to any relationship and at the same time perfect just for you. It’s the first ever toy that can be used in such a multitude of ways. Valentine’s Day isn’t the same without chocolates. These yummy dairy free chocolate available from Yumbles is the perfect treat for any diet. You can also get Emotional Balance gentle and soothing aromatherapy massage oil. To win these aromatherapy oils, head over to this page. 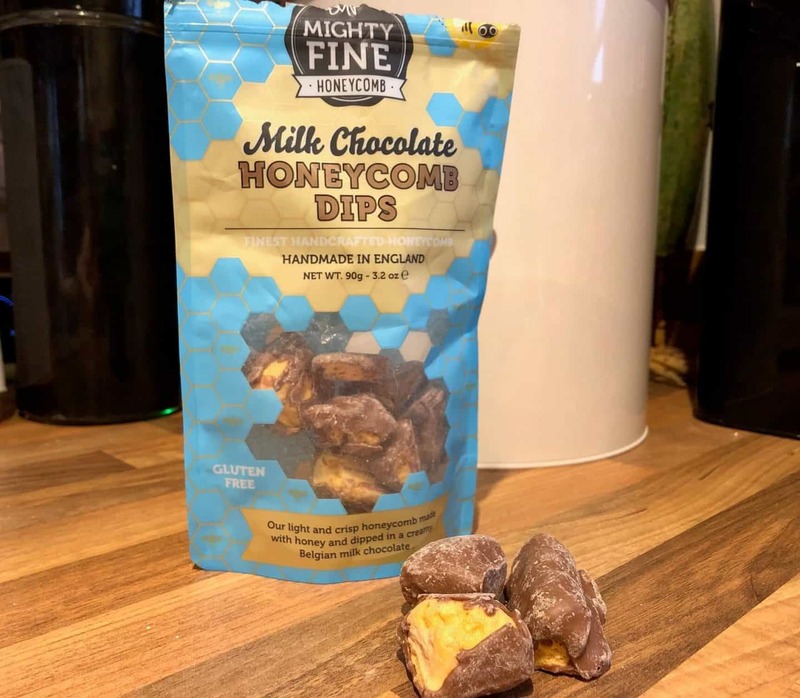 Mighty Fine’s delicious signature light & crisp honeycomb is made with British honey, and covered in a variety of the finest ingredients; Belgium milk chocolate, Belgium dark chocolate and Salted Caramel. These are so scrummy, trust me. Light, crispy and extremely moreish. 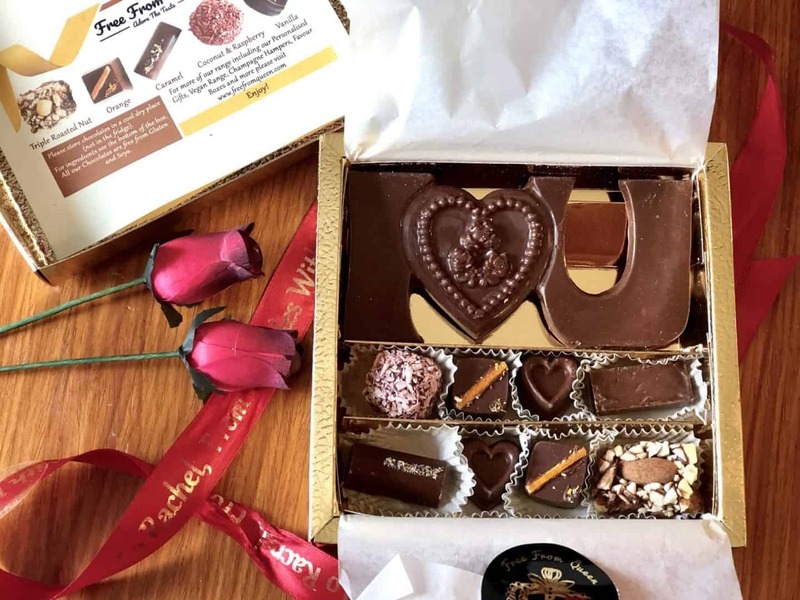 They would make a lovely gift for the chocoholic in your life! Plus they are vegetarian and gluten free. Available from: Mighty Fine and in store at Sainsbury’s, Amazon, Superdrug, WHS, Whole Foods, Harvey Nichols, Waitrose, John Lewis, BP and speciality independent stores across the UK. Shrooms to boost your libido this Valentine’s Day! So put the kick back in to your love life with this little mushroom of love! Available from Harrods and Planet Organic. How about a gift of a night away on a charming escape? This would make the ideal gift for your loved one. 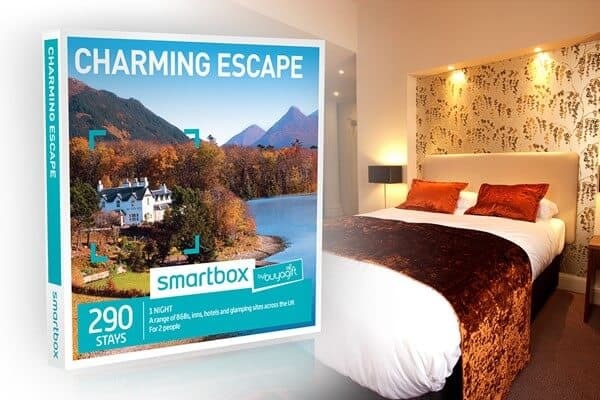 They have got something to suit everyone, with an incredible selection of quirky, cute, and traditional one night breaks. Featuring everything from seaside retreats to rural escapes, you are sure to find the perfect break for the two of you. Buyagift have kindly let me giveaway one of these charming escape breaks to one of you, my fantastic readers! To be in with the chance of winning, please fill in the gleam widget below. Terms and Conditions – The prize is non-transferable and no cash alternative will be offered. The winner will be selected at random via gleam from all valid entries and be notified by Twitter and/or email within 7 days. The winner will have 28 days to respond with a name and address for shipping before a new winner is selected. Open to all UK entrants aged 18 or over only. Facebook and Twitter are in no way associated with the giveaway’s. Any personal data given as part of the competition entry’s is used for this purpose only and will not be shared with third parties. The winner’s details will be passed onto Buyagift for prize fulfilment. 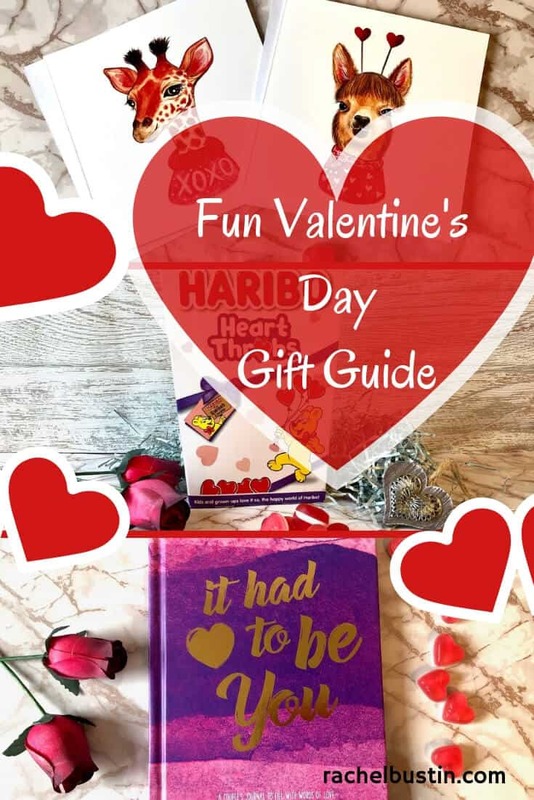 Thanks for stopping by today, I’m sure I’ve given you plenty of ideas for Valentine’s Day gifts, but if you are still looking, check out these ideas that may be a bit different from The Incidental Parent. I bought my partner a golfing weekend away and some socks with my face printed on! i bought him some aftershave, slippers and box of his fave chocs. Nothing for me, I bought a card and made a lovely meal. I didn’t buy anything for Valentine’s but I’d like to treat myself to this charming escape. I got my hubby dollymixtures & doritos & dips, his favourite things! we both headed out for a meal, dancing and then back home to relax. Great night out. I treated them to a takeaway and lots of chocolates. We booked ourselves a night away….for next week. Amazing as usually we ignore the whole valentine theme. I would bring him some chocolates and cook him a steak ! I treated him to a bottle of gjnger liqueur and a meal out. We usually have a treat meal and a bottle of fizz, rather than gifts. I just gave my boyfriend a card and we cooked a lush dinner at home. I’m low on funds so I haven’t bought anything for Valentine’s Day. I’m single too. I bought my partner some earrings. I buy him a card and prepare nibbles and prosecco for a romantic night in! Nothing, I don’t have a Valentine! I brought him some of his favourite chocolates. I’m single, Valentines Day is just another day on the calendar. Nothing but a homemade card this year. Hubby has been on long term sick leave so money is tight. I’m not buying him anything but my present will be when I give birth to our child. I treated my self to a nice bottle of rose champagne which I’m enjoying now. I’m single so Valentine’s Day doesn’t register I’m afraid. A short break away would be lovely though. A card and some lovely heart chocolates from M&S. Dinner at our favourite Italian restaurant in Russell Square, London. I cooked my husband a special meal and he bought me some flowers. Just got a bit of extra chocolate in the end, but I’m not going to complain about extra chocolate! I don’t have a Valentine but I treated myself to some flowers. Just a card for my husband. I don’t feel the need to go over board, I’d rather give him my time than give big companies my money! A lovely meal out but not on Valentines night! I won’t be buying anything. A nature book and a bottle of whisky! He’ll be happy! I’m making a nice meal for 2! A ticket to see Happy Death Day 2U at the cinema!! We don’t do presents or cards but I may have to get something special in for tea. We don’t bother with gifts, I’ll cook a nice meal and he’ll wash up! The gift guide is so useful, I might even be tempted to spoil him to something. We dont usually celebrate valentines day. We don’t really do valentines gifts, but we always make sure that we spend the evening together and do something special! Not the most exciting gift but I bought him a shirt! We usually have a lovely homecooked meal with flowers and candles! My husband is organising a surprise. I have no idea what to get him! We don’t really do presents, I’ll just make him a nice meal. We are both skint, so just spending time together will be enough! I love, love! a big fat nothing BUT we will have a lovely meal … with the kids!! His birthday is the 19th, so I am buying him a Chromebook for both and having a nice meal. I’ll be treating myself seeing as no one else will! I’ll buy a huge bar a chocolate. We usually buy each other some chocolate. Thanks for this lovely giveaway. And Early night! And a Lie in! We do little tokens! I usually cook my hubby a special meal and he gets an anonymous card! We buy each other romantic gifts all through the year but tend to avoid Valentine’s when all the prices go sky high! Nothing! I don’t really buy my husband anything, he buys what he wants so it would be a waste of money! we usually just do cards so that will be it! we do not usually do anything for Valentines day, lucky if I get a card! I think it will be a video game and some beer to enjoy. we are going on a twilight spa experience with a meal afterwards. It will probably be chocolate! I will be buying my husband a nice bottle of red wine this Valentines Day! I need a relaxing break! I’m not sure yet, can’t believe it is February already! We will probably buy some really nice food to have at home as we will be in with the children! I will be taking other for a meal and good old Wetherspoons – joint present. My husband and I are going out for a nice Valentine’s meal. We don’t really do valentines day but might make a nice meal. 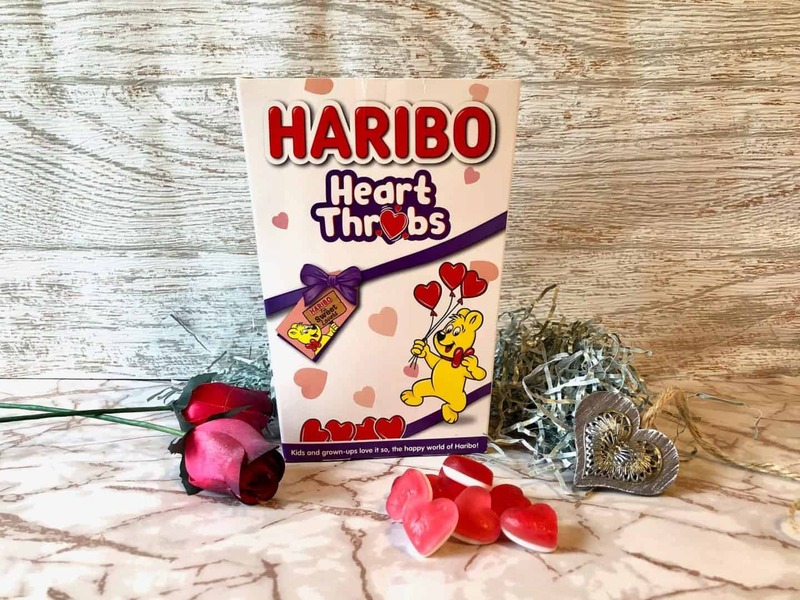 What will you be buying your loved one this Valentine’s, or yourself? I am buying my partner Boss aftershave. We don’t do Valentine’s day, I think love is and all year round kind of thing! Cooking a lovely meal of steak, chips, mushrooms and onion rings with a bottle of red wine..
I’ll be buying my wife some lingerie. My other half doesn’t do valentines so I’ll be treating my 5 kids to some heart chocolates and special little notes hidden around the house. we are going to Blackpool on the 16th so we will be spending money on each other there. It’s also little ones birthday on the 13th so a combined treat for us all. I’ll be buying my wife some wine. Thanks for the gift guide – I’m sure it will inspire us all!